When tough circumstances force Kammie’s family to relocate, she’s determined to make the most of the change. She approaches the prettiest, most popular girls and attempts to join their group. Only what results is Kammie standing on a board that splits and sends her tumbling into a well. Trapped and slowly sinking further, Kammie begs her new “friends” to help her get out. As she waits for them to bring help (and wonders if they’ve simply abandoned her) she begins to think about the good times lost and the struggles her family currently faces. Then she begins to run out of air. Joined by hallucinations, some less than friendly, Kammie wonders if she’ll be rescued, or if her last view of the world will be the dark interior of the well and the small circle of sky above her. 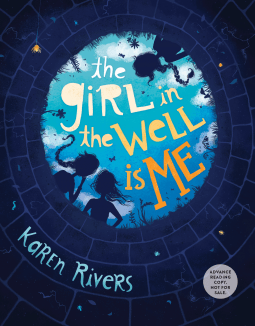 At first I worried that a story about a girl trapped in a well would be sort of boring. I imagine it’s kind of the way people felt before seeing Rear Window when they learned that the whole movie was filmed on a tiny set about a man in a wheelchair. (Other than the scene in which he breaks his leg, we see the whole movie from his apartment. Crazy.) Anyway – this book was not as suspenseful as the classic Hitchcock film, but it never tried to be. Still, it was far from boring. I liked Kammie pretty immediately. She’s a spunky narrator. You can feel how hard she’s trying to fit in and have a posse around her and how lonely and isolated she is since all the drama with her family has happened. You know she’s worth ten of each of the silly girls she wanted to be friends with, and she’s smart enough to realize it, too. I thought her relationship with her brother was especially moving. I can’t think of a lot of stories with good examples of brother/sister relationships during that time of life when sibs sometimes grow apart, each seeking their own identity. I liked that this story captured that process so well, even if it was bittersweet. Kammie’s memories of her life before falling in the well are definitely what keeps the story moving between rescue-related events. Rivers unwinds bits and pieces of this nameless tragedy that shattered Kammie’s life, and it was easy to chase those hints and flashes down looking for what really happened to this remarkable girl. I thought the tone and the brief use of profanity made it a heavier read than most other middle grade books. Don’t get me wrong – I thought the story was great. See below for more specifics on content. One swear word is repeated several times in a sentence as Kammie realizes the dire situation she’s in. There are a few crude references to bodily functions. Kammie thinks about her grandma, who has died, and wonders briefly if she’s in Heaven. Girls play a prank on Kammie which leads to her falling into a well. Kammie sustains serious injuries due to her fall. Tagged Algonquin Young Readers, bullying, Karen Rivers, Moving, netgalley, The Girl in the Well is Me, Trapped. Bookmark the permalink.